Each October/November, the HGRG runs a one-day conference for undergraduate and postgraduate students with research interests in historical geography (broadly conceived), incorporating keynote addresses, workshops, and social events. On this page you can find details of previous conferences (including PDFs of conference programmes) and announcements of future conferences. The 23rd Annual Practising Historical Geography Conference was held at Manchester Metropolitan University on the November 8th, 2017. The conference is designed for postgraduate and undergraduate students with research interests in historical geography. It aims to give attendees an insight into the kind of research going on in the field, as well as providing an opportunity for networking and socialising. This was my fifth time attending the conference; I have only missed one since I started my postgraduate career in 2013. The reason I keep coming back is that Practising Historical Geography is always a rewarding, interesting, and stimulating experience, and this year was no exception. The day involves: two keynote speakers; two methodological workshops; a Postgraduate Voices presentation by a recently completed PhD student; and a paper by the HGRG undergraduate dissertation prize winner. In her introduction to the conference, HGRG Chair Dr Briony McDonagh reported that historical geography was in “rude health”, quoting Simon Naylor’s recent review of the field inTransactions. By the end of the day, I couldn’t help but agree. The keynote lectures, given by Professor Jon Stobbart and Dr Kimberly Peters, were both fantastic, and they highlighted the diversity of research being conducted in the field. Professor Stobbart discussed the construction of ‘comfortable’ homes in Georgian England using material objects. Dr Peters talked about the development of maritime ‘motorways,’ shipping lanes designed to minimise the chance of large container ships colliding head-on. I never thought that I would find maritime trade so interesting! The two workshops were also excellent. The first, organised by Dr Sarah Mills, was about the ethics of archival research. I must admit that I generally fall into the trap of assuming I don’t need to think too much about ethics because I research the past, but the workshop made me realise it was something I should pay more attention to. Dr Mills conducts research on the historical geographies of youth citizenship and volunteering, which is ethically more sensitive than researching adults, but the workshop was a reminder that ethical considerations should be built into any research project, historical or otherwise. The second workshop, run by Dr James Kneale, was about the merits and challenges of time capsules for historical research. During the recent demolition of the Temperance Hospital in London, two time capsules were found, and Dr Kneale was asked to consult on their contents. Whilst it seems unlikely that many historical geographers will find themselves in a similar situation during their careers, we had some challenging discussions about the nature, meaning, purpose, and use of time capsules. It also led to some interesting conversations about the nature of historical sources more generally; with historical research it is always necessary to consider why the sources you are consulting were produced, and why they were preserved. This year, I gave the Postgraduate Voices talk. I was pleased to be asked, as the Practising Historical Geography conferences have been an important part of my PhD. I have valued the time spent with other enthusiastic researchers who have been unfailingly supportive over the last five years. Because of how much I have got out of these conferences, I decided to use my Postgraduate Voices presentation to talk about my place in the academic communities that played such an important role in my PhD. Doing a PhD can be a lonely experience, so I think it is essential to take a bit of time and effort to participate in academic networks when you get the chance. Every year, the HGRG runs a competition in association with Routledge to find the best undergraduate dissertation in historical geography. Amongst other things, the winners are invited to present their work at the Practising Historical Geography conference. The 2017 winner was Anna Lawrence, from the University of Cambridge. Anna gave an excellent presentation on her dissertation entitled: “Morals and Mignonette: the use of flowers in the Moral Regulation of Women, Children, and the working classes in Late-Victorian London.” Her arguments about how the symbolism of flowers was used to discipline different groups were clear and persuasive. Practising Historical Geography conferences are always brilliant events, and this year was no different. I went home feeling energised, with a renewed enthusiasm for my own research. I would like to say thank you to the HGRG committee, particularly Dr Cheryl McGeachan and Dr Hannah Neate, for organising such a successful event. There are two conference reports for 2016, the first by Joanne Norcup and the second by Laura Crawford and Iara Calton. The annual Practising Historical Geography conference is a happy place on the HGRG calendar. It invites practitioners to set time aside during the first term of the academic year in which to spend a day listening, discussing and reflecting on the practise, performance and professional challenges of undertaking historical geography.If resources permit, it is an enriching experience and one strongly recommended. During my time as doctoral researcher, I was only able to attend one pervious event (2008, University of Exeter), so I was thrilled to be invited to speak about my postgraduate reflections at the 22nd Practising Historical Geography Conference held at the University of Aberystwyth. Holding the conference in Aberystwyth meant for me and many other delegates travelling the day before. Armed with intellectually expanding and historically inclined reading matter* and a window seat to enable bird-watching along the Dovey Estuary, it was an enjoyable commute. Once settled in Aberystwyth, there was time to explore the historical market town and ramble around its glorious coastal situation with starling murmurations around the pier and views across Cardigan Bay. An evening meal at Baravin enabled the majority of attendees to introduce themselves and socialise under the watchful eyes of a large rendered head of Tom Jones before (a quick nightcap for some and) sleep. A bright and brisk morning heralded the conference proper, which began with Welsh cakes and hot beverages. HGRG Chair Briony McDonough gave the welcome and introduced the day itself. In a slight change to the structure of previous Practising Historical Geography gatherings, the small numbers of attendees meant we would all be present for papers and workshop sessions scheduled for the morning, with the added bonus of a visit to the National Library of Wales and its archives after lunch. Peter Merriman (Aberystwyth) began proceedings with a paper entitled ‘Modern Women on Modern Machines: cultural constructions of women motorists in late Victorian and Edwardian Britain’. Reflecting on archival materials he had touched on in his 2012 monograph Mobilities, Spaces and Culture, Merriman discussed the way letters pages and advertising illuminated broader and interconnected technological, cultural, and political discussions regarding the gendered and privileging nature of access to motoring technology and the mobility of gendered bodies as drawn out in the pages of the specialist motoring press of the late Victorian and Edwardian period. In ‘Postgraduate Voices: reflecting on past postgraduate experiences’ I was able to ruminate on the relative merits of undertaking doctoral research as a mature part-time student. In particular, I discussed the benefits and challenges ‘slow’ research methodologies have in supporting the recovery of dispersed dissenting historical accounts of the recent past. Illustrating this through examples from a decade recovering the stories and archive attached to a Leftist critical geography journal published during the 1980s (Contemporary Issues in Geography and Education) more genera l discussions were had regarding where such research practice sits in relation to cultures of professional performance (finishing doctoral research within a three year funding timescale, maximum publishing output and high-profile networking) and how alternative ways of undertaking historical geographical research need asserting if diversity of voices, approaches, practices and personnel are to be sustained for the enrichment of work undertaken in historical geography and academia more generally. Research into alternative accounts of 1980s political landscapes continued in the workshop after the coffee break. Dairmaid Kelliher’s (Glasgow) session ‘Filming Solidarity: Independent documentary and the 1984-5 miners’ strike’ the workshop screened four different examples of video resources independently produced to garner solidarity and support for striking miners and their communities when screened in an array of different community spaces during the strikes in the mid1980s. These films variously tapped into particular union histories of strike solidarity and responded to right-wing media misrepresentation of community activism at the time. In our groups we were asked to reflect on the content, framing and the way ideas of solidarity were engendered. In asking questions of the footage, broader questions arouse regarding the demise of regional knowledges and the remoteness of the recent past, processes of archiving, how education of the recent past is culturally mediated and to what extent dissenting historical narratives find space in contemporary cultural and political discussions. The keynote lecture was given by Dominique Moran (Birmingham). Entitled ‘Carceral Pasts: Ubiquitous, Uncomfortable, Usable? The lecture began with Moran reflecting on her own research career and how the use of historical resources and historical research practices enabled and enriched her work into carceral geographies of the past and in the present. Acknowledging her recent publication with Karen Morin (Historical Geography of Prisons: Unlocking useable carceral Pasts) Moran used examples to discuss how historical carceral spaces have been reimagined and repurposed. Such transformation of carceral space from penal institution to heritage site, film location or housing redevelopment raised further questions about access to prisoner histories and popular understanding about the realities of contemporary carceral spaces in contemporary societies. There was a lot to ruminate on over lunch, and ideas percolated during the afternoon as we were given access to some of the holdings of the National Library of Wales and a tour of the library itself. Located at the edge of the University campus with views looking over Cardigan Bay and Aberystwyth, there was much joy to be had in rummaging through artefacts and visiting exhibition spaces within the library. It was a thoroughly enjoyable and thoughtful time. Many thanks to Cheryl McGeachan, Briony McDonagh, Hannah Neate, Liz Gagen, Pete Merriman, and to all who contributed presentations and questions. The long journey was made worthwhile by the opportunity to explore the town and discover its rich history, from the ruins of the Iron Age castle to the iconic Victorian seafront. Those who timed their arrival well were lucky enough to witness the starling murmuration as the sun set over Aberystwyth Pier. The conference networking started the evening before with a lovely meal near the seafront in Aberystwyth. Everyone became acquainted and competed for the furthest distance travelled to reach the conference. The Glasgow University team won hands down! On the sunny morning of 2nd November after trekking up the hill to reach campus, the conference was underway. In her opening remarks, Briony McDonagh posed some thought-provoking questions for consideration. Namely, whether historical-geography can truly be critical and whether we should strive to, or it is indeed possible, to do more historical-geographical work in the field. We were left to ponder these questions throughout the day, and were onto the first speaker. Peter Merriman’s keynote lecture explored embodied practices in the context of motoring and included revealing conceptions of gender in Victorian Britain. His research engaged with a range of source material including driving magazines, and it was interesting to see how driving was deemed firmly in the male domain and the emergence of female drivers caused mixed opinion about the use of the road as a space. We considered the challenges women made to established norms regarding female bodily capacity, and heard how car manufacturers exploited this by advertising cars that were more suitable for ladies body comportment. Jo Norcup reflected on her postgraduate experience working on a PhD part-time , how her project developed and how the discovery of new source material changed the direction of her enquiry. This was a hugely valuable lesson for any PhD student, demonstrating both the benefits and challenges of working with archival material. Normally, the undergraduate dissertation prize winner would present their work at this point but unfortunately, the winner had not yet been announced. The programme therefore moved onto an important feature – the coffee break – which provided an opportunity to continue networking and for some of us to sample our very first Welsh Cakes! What a delight to see the inclusion of a workshop by a current PhD student, Diarmaid Kelliher, in his final year of his PhD. Diarmaid explored the mining strike in 1983/4 and in the workshop we looked at several film clips showing solidarity for the strikes from a range of sub-sections of society. In groups we discussed the value of film as a resource to inform historical-geographical work. Discussions surrounded the polemical nature of film and the way the edit can affect what messages are conveyed. Weultimately concluded that film can be an incredibly useful and revealing source and were left to consider how we could incorporate film in our own research areas. Lunch was a chance to enjoy a bit of winter sun and the views over Aberystwyth. This was so nice, that an obligatory selfie was required! After lunch, Dominique Moran introduced us to her work on carceral geography. Dominique explained how her background was not strictly as a historical-geographer but her recent work and research interests had attracted her to this approach, and she made a case for the value of a historical view informing contemporary research. We tackled the notion of incarceration and queried whether it was possible to have post-prisons, utilising these spaces for different purposes. Dominique showcased a range of snapshots of how prisons have been repurposed including transient uses such as film sets. We also explored the notion of dark tourism where carceral pasts are reconfigured into heritage sites deemed to have historical importance, examples including Alcatraz and Robben Island. The examples deployed reinforced the value of utilising a historical approach, challenging us to consider how the contemporary function of these spaces were influenced by dark histories, and that the modern day is inextricably bound-up with meanings created and produced through time. Visiting the National Library of Wales was a brilliant addition to the conference programme. It was great to be surrounded by a group of like-minded individuals, excited at the prospect of exploring archives and libraries. Staff at the National Library of Wales kindly gave us an introduction to their catalogue and produced some original archival materials for us to look at. We then went on a tour of the building, exploring the different reading rooms and some photo exhibitions on WWI and the Aberfan coal-mining disaster in 1966. The best part of the day was seeing the variety of activities being undertaken by both academics and current PhD students: everything from education, to explorers in Greenland, and to farming in Canada. The breadth of topics was really inspiring demonstrating the variety of contributions to knowledge historical-geographers are making. Similarly, it was great to network as a group of students at different stages in their programmes with attendees ranging from Masters students in the process of applying for PhDs to those preparing to submit their theses. The opportunity to share our experiences (both the highs and the lows) and advice was invaluable. As a new PhD student I couldn’t have asked for a better introduction to the world of historical-geography. Thanks to Aberystwyth University for hosting and to Cheryl and Briony and all those at HGRG and the RGS-IBG who helped make the day a success. The Practising Historical Geography conference came of age this year as the 21st event was held at the University of Sussex, near Brighton on 28th October. For postgraduate students from across the UK, the conference was indeed the key to a world of networking opportunities and fascinating research. It is a long journey from Nottingham down to Brighton (four hours by train), but having been on two previous occasions (in Preston (2013) and Bristol (2014)) this conference is for me one of the highlights of the academic calendar, so thought-provoking and useful had the previous events been. I sheepishly admit that my decision to attend was also influenced by the opportunity to ride on the Thameslink train service for the first time, and to witness the starling murmuration (huge flock) that comes into roost on the derelict remains of Brighton’s West Pier each evening, performing stunning feats of aerial acrobatics as it does so. Thameslink and the starling murmuration were, respectively, disappointingly slow and seemingly non-existent, yet the conference itself was, as ever, a richly rewarding experience. The conference is as useful for the networking opportunities it affords as for the content of the talks—excellent as these undoubtedly are—and on the night before the event many of the participants had a meal at a branch of Bill’s in Brighton (which I just about managed to find despite confusing North Street and North Road and then struggling to find the entrance). This was a fantastic opportunity to catch up with old acquaintances and make a few new ones too. The next morning we headed to the Falmer campus of the University of Sussex (just north of Brighton itself) for the conference proper. Fuelled by a coffee from an establishment with the suitably hipster title of ‘The Flying Coffee Bean’, and just about managing to board the right train (there were two leaving at the same time to different places) myself and the HGRG’s new membership officer Dr Iain Robertson (University of the Highlands and Islands), whom I had met on the train, headed unsurely to the grandiosely entitled Global Resource Centre in the Arts C building. The first keynote lecture was by Simon Rycroft (Sussex) and was entitled ‘Mid-century representation: John Latham’s cosmos’. Here Rycroft used John Latham’s art as a case study of the new kinds of (often more than visual) artistic representation which emerged in the years following the publication of Einstein’s theories of relativity, from the 1920s onwards. Examples of Latham’s work which included the use of the spray gun in order to embody human creative energy and immortalise the history of one brief event, and the burning of books as a process of dematerialisation and an undermining of their particular narrative, textual, structure, reflected the cosmic speculation which artists engaged in following the discovery that matter and energy were interchangeable. Pertinently, Rycroft argued that Latham’s Artist Placement Group scheme (which still exists today) which enables artists to within particular organisations and companies represented an early, yet markedly different, form of what we would now label as ‘impact’. Following Simon Rycroft’s lecture, Jake Hodder (Nottingham) filled the ‘Postgraduate Voices’ slot. He talked of the three crises of PhD life, which roughly correspond with the three years of the PhD. These were Imposter Syndrome, in which you fear that you do not belong in academia and will be ‘found out’, the ‘Not Coming Together’ phase, in which you fear that the project will never form a coherent whole and that you will not be able to find enough useful information in the archives, and the ‘Uncertainty’ phase at the end of the PhD, as the money begins to run low and it is unclear what the future will hold. I think everyone in the room could perhaps identify with at least one of Jake’s three crises, and the fact that he was not only able to get through these but secure a postdoc following his studies gave those of us who are still en route to the viva some reassurance and hope. Jake’s talk was followed by an excellent presentation by Victoria Bellamy, (Cambridge) winner of the HGRG’s undergraduate dissertation prize. She talked about her research into Victoria Park in East London, an ‘oasis of green’ in the city which was viewed in the Victorian age as a way of providing the poor with a healthier, more sanitary environment but which was not physically secure (as the boundary fence was repeatedly breached) and which was both constantly contested by different interest groups and also entwined in social and moral debates (such as that which weighed the necessity of bathing against its immodesty). After a pit stop for coffee and biscuits (the quality of the latter was rather splendid this year), we split into two groups and each undertook a different workshop, punctuated by lunch (which was also an excellent spread). One of these, by Fae Dussart (Sussex), focussed on the concept of the home within patriotic and imperialist discourses of the 19th century Britishness. Attendees were asked about their own understandings and associations of home (one of the attendees recounted the nasal stimulations of his own upbringing near the Cadbury factory in Bourneville) before discussing a series of textual extracts, particularly in relation to the labour relations and spatial distinctions which underpinned the organisation of Victorian middle-class housing. The second workshop was led by Lucy Veale (Nottingham) and drew from her AHRC Weather Extremes project, which seeks to identify and plot extreme weather events utilising historical records (including diaries and journals) and oral history. Lucy began by asking people to recount their own experiences of extreme weather, before focussing on the Great Storm of 1987, using contemporary newspaper extracts which recounted the damage to the University of Sussex itself. Weather can evoke strong emotions; one of the participants was moved to tears by the memory of seeing so many ancient, beautiful trees destroyed quite literally overnight. We then looked at some of the archival sources which Lucy is using in the Weather Extremes project, discussing some of the challenges of using this methodology, from finding appropriate information in archive catalogues to reading scrawled, spidery handwriting! After another coffee break, the second keynote—and last event of the day—took place. Presented by James Kneale (UCL), it was entitled ‘Looking for Drink in the Archive’, and detailed the work that Kneale has undertaken in relation to the temperance movement in the nineteenth century. Whilst some of the key figures involved in this movement appeared to adopt a ‘do as I say, not as I do’ approach, with some owning collections of bottled beverages in their basement or even public houses, Kneale suggested that something more was going on here than straightforward hypocrisy, since alcohol was often considered to be medicinal, with alcohol consumption even deemed to be necessary for one’s survival. Kneale demonstrated that attitudes to alcohol in the nineteenth century were relational; bound-up in complex networks which incorporated medicinal testing, insurance policies and artistic representation. The conference finished after Kneale’s talk, and the attendees drifted homewards. For both those who had attended this and other historical geography conferences before, and those who were new to this type of event or, indeed, to historical geography as a whole, it had been a fascinating exercise, providing much food for thought. Well done to Lucy Veale, conference organiser, for putting this and the last three Practising Historical Geography Conferences together. Her successor to this role, Cheryl McGeachan (Glasgow), certainly has a tough act to follow! On the eve of the 20th annual postgraduate and undergraduate conference Historical Geography students emerged from their natural habitat – the carrel desk space. This well-deserved diversion began with a visit to the modern Riverstation restaurant, which provided an informal opportunity to socialise with other emerging geographers and leave behind the often isolated nature of research for a few hours. But as usual, most conversations turned quickly to our academic passion, and there is, as always, a welcome motivation to be (re)gained from swapping stories and discussing one’s own project with others. The next morning the stunning and historic architectural space of the University of Bristol’s School of Geographical Science awed the conference participants and promised a fruitful and motivating environment. Welcomed by the HGRG Chair Carl Griffin, the numerous attendees from all over the UK prepared for an inspiring and exciting day hearing about emerging research approaches and fields, but also anticipating many opportunities to socialize. For the first talk, inside a lecture theatre with bright but rather clinical lights, Tim Cole delivered a sobering, but nevertheless intriguing and thought provoking, lecture on the Holocaust as embodied experience and a place-making event. Cole’s discussion of ways to visualize the archive using GIS demonstrated the potential of mapping memories and narratives to make information more accessible and to unearth potentially overlooked networks and spatial references. The talk was followed by a lively discussion about potential issues of generalizing and possibly aestheticizing places occupied by violence, which quickly lead one to reflect on the need for researchers to be sensitive to ways in which data may be used. After a coffee break two speakers, near the end of their PhD’s, spoke to us about their experiences of practising historical geography in the ‘Postgraduate Voices’ session. First was Ceri Price who told us about the ‘trials, tribulations and triumphs of the archives’ with her work on picture postcards. She spoke about the practicalities of knowing how to limit what can be a never-ending archive and how she was able to categorise and differentiate between diverse types of postcards, the styles and significance of which shifted over time. It was a really interesting and thought provoking discussion of everyday objects which we all use (though increasingly less often) but the history of which few of us will have considered. Joanna Mann then gave us a very honest appraisal of her experience in the archives while investigating Shetland lace and the ecologies of practice. Joanna discovered the challenges of entering an unknown, confusingly ordered archive but made unexpected discoveries and ended up engaging with the archive in a practical way, knitting a shawl from an old pattern she had found. She let us all pass around the shawl and so we all experienced our own textural engagement with her archive. These were both fascinating insights into postgraduate historical geography research and I’m sure all of us who use archives took something away for our own work. We were then split into two groups to partake in practical sessions, one with Briony McDonagh and the other with Andy Flack. With Briony we looked, in intricate detail, at maps of Burton Agnes in Yorkshire over various time periods. We observed what was and wasn’t included and made our own maps compiling features such as parish boundaries and transport routes as well as searching for the most ancient features we could find- tumuli were the winners here. This allowed us to notice historical changes over time such as the construction of a railway and the movement from common land to enclosure. It was a fun, engaging session and I certainly have a great deal of respect for Briony’s talent at differentiating between numerous types of dotted lines on a map. The second session run by Andy Flack involved us in uncovering the changing space of Bristol Zoo between 1835 and today. We started out comparing maps of the zoo from different dates, which illustrated how attitudes towards animals in captivity have changed, how the role of the zoo shifted to become increasingly centred on the animals, and the balance between science and spectacle in the zoo. We also looked at historical photographs from the zoo, some shocking in terms of what had previously been deemed an acceptable animal enclosure, which in itself is indicative of our modern animal rights consciousness. Andy’s session finished with the textual discourse of documents such as cartoons relating to zoos and the relationship between humans and animals in captivity. These two sessions were really helpful in giving us a practical taster of two types of historical geography practice and group activities definitely made for a welcome break from the often-solitary PhD experience. After the afternoon coffee break Jessica Dubow from the University of Sheffield introduced us to her work on Critical Theory in a talk about the agenda of memory in the archive. The lecture, just like Cole’s, focused on narratives of the Holocaust, but this time took place in the historic Peel Lecture Theatre. Inside, the fireplace framed by drapes and the heavy dark wooden beams of the room set the atmosphere to lead us from Cole’s modern computer lab into Dubow’s archive. In this historic room Dubow used the powerful metaphor of Humboldt’s parrot – the last language speaker of an extinct group – to lure us to the void located between the unspeakable experienced moment and the archived traces of the Holocaust. Discussing Max Sebald’s post-Holocaust novel Austerlitz and the reoccurring parrot within the book, Dubow utilized the metaphor herself to address the unspeakable testimony of the witnessed genocide. Pointing to the problem with the archive attests the importance of reflecting on the position of the researcher in relation to the material. To sum up, the day’s lectures and workshops encouraged us to practise Historical Geography and to rethink ways to engage with the archive and data. We also want to take this opportunity to thank all of the speakers, especially the conference organizer Lucy Veale, for their efforts in providing us with food for thought to take back to our desks. Despite the date of the HGRG Annual Postgraduate and Undergraduate Conference being Wednesday 6th November, the reality was that it began with drinks at the Black Horse pub the evening before. This ‘unofficial’ programme of events allowed us to whet our academic appetites in our newly constructed site of social exchange as we began to build a network of enthusiastic and emerging historical geographers from across the UK. Congregating the next morning at the UCLan Greenbank Building (heads thankfully clear), the official programme opened with the HGRG Chair Dr. Carl Griffin giving us one of his inimitable welcomes. Professor Alan Rice then delivered his keynote lecture, ‘The Politics of Black Bodies in Lancashire and the Atlantic World: The Legacy of Ghostly Mementoes and the Redemptive Power of Guerrilla Memorialisation’. Prof. Rice expanded the ‘ghost’ metaphor haunting his research through a grisly anecdote of a severed limb. He read a vignette in which a young girl played with a mummified slave’s hand in 1940s rural England. This quote served as a verbal ‘artefact’ through which Prof Rice weaved three centuries of Atlantic slaving history, from Fanny’s birth – the owner of the hand – in c.1750 Caribbean to walking tours in present day Lancashire, all joined along a seam of memories, memorials and heritage. It revealed an evocative way to ‘expand’ the archive and bind past events to present day vestiges. In addition, this vivid account palpably foreshadowed the actual material artefacts we later engaged with, using our feet, hands and eyes. Before that, was the coffee break. These caffeinated interludes of banter, biscuits and a jam doughnut or two punctuate any worthwhile conference. It can’t all be keynotes and workshops. Personally and professionally, these chats enliven more ‘scholarly’ matters. In the Greenbank Building’s tall foyer we shook hands, traded ideas and planted the seeds for amiable conferences down the line. On either side of lunch lay the day’s workshops. Hannah Neate led us down the wet pavement on our very own ‘Walking and Talking’ Tour to a contentious architectural landmark: the Preston bus station. Hannah exemplified her participatory approach to historical research by bringing us into contact with the stark material presence and dimensions of this infamous modernist structure, which is now a Grade II listed heritage building. Rain failed to dampen interest in the empty, almost eerie rooftop car park. Indeed the day’s cold grey skies seemed to compliment the exposed, raw concrete all around us. Prompted by postcard questionnaires, we reflected on where historical geographers carry out research and the role of fieldwork in helping us to understand our topics. More broadly, it prompted us to contemplate the role of researcher subjectivities in the archive – whatever form that ‘archive’ may take. Merle Patchett continued this practical theme of material engagement indoors and dry. She introduced us to ‘bird bits’ to tell the story of millinery practices in the late 19th century ‘plume boom’ and to teach us how to ‘fashion feathers’ (and other material objects) into our historical research. We played the role of curator and labelled specimens to consider the historical geographies of these feathered artefacts. These ‘unclassifiable’ objects commonly lie forgotten in the backs of museum store-rooms, but through handling them, inspecting, and investigating them we were able to see how a bird of paradise existing without eyes or body, but only tail feathers, could become a wealth of information: an ‘archive’ in itself. Following on from these workshops we were back in the lecture hall, listening to our second keynote speaker David Featherstone He closed the Conference with his talk on ‘Labour, agency and decolonisation: the political trajectories of Harry O’Connell’ which fittingly drew upon many of the themes of the day. David mapped the many different threads that could be traced from the life of O’Connell. He demonstrated how in reconstructing O’Connell’s role as organizer in Cardiff’s multi-ethnic seafaring community could carve a new historical and geographical approach to link labour organization to anti-colonial politics. Good byes were then said and we all prepared to leave; or more accurately, walked to the local pub to wait out the couple of hours until the train home. The practical advice gleaned from the day was that artefacts are always in a state of ‘becoming’, with the geographies and histories of their making waiting to be (re)told – we, as postgraduate historical geographers, are now poised to become their possible story-tellers. 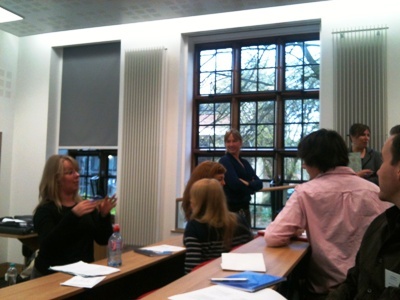 Dr Hilary Geoghegan leading a discussion on “Loving historical geography: enthusiasm as part of the research process”. The 18th Annual Practising Historical Geography conference took place at the beginning of November 2012 at the University of Hull, and was attended by 36 delegates and speakers from 13 different institutions. The conference provides postgraduate students of Historical Geography a taste of the breadth and vitality of work in the sub-discipline, as well as providing a welcoming environment for students to learn, experiment and expand their own theoretical and methodological skills to further their own research. Furthermore, the conference also serves to provide a friendly environment for students to network and converse about their shared experiences of working and studying in Historical Geography. This year, this was started the night before the conference, when many of the students and academics met for a meal. This was a fantastic way to spend the evening, as most people were in Hull that night anyway, and it provided the perfect opportunity to meet fellow Historical Geographers in a relaxed atmosphere. Again breaking from tradition, this year the conference started with two small-group practical workshops. This year, these were facilitated by Hilary Geoghegan (UCL), who helped us engage and explore our passions for the research process and work dissemination through her session “Loving Historical Geography: enthusiasm as part of the research process”, and Kevin Milburn (University of Nottingham) who opened up the possibilities of different research sources and methods through his session “Sonic Histories and Aural Geographies”. These small-scale workshops help open up dialogue between students, allowing engaging and interesting discussions to unfold, as well as learning a little more about a number of different topics. This year, the keynote papers were given by Uma Kothari whose paper was titled ‘Contesting Colonial Rule: politics of exile in the Indian Ocean’, (University of Manchester) and Elizabeth Gagen who presented: ‘From muscular health to emotional intelligence: historicising governance in mind/body relations’, (University of Hull). Both speakers gave empirically rich, substantive and thought provoking papers which together demonstrated the diversity of historical sources and approaches available to students. This was further evident in a fascinating short presentation given by recent undergraduate dissertation prize winner Tom Crawford (University of Bristol) titled ‘Production, Power and Performance in the Atlas Novus of 1645 by W. and J. Blaeu’. Tom’s presentation covered a range of theoretical areas, and was empirically rich and was extremely well presented, many people urged him to continue researching within the field of Historical Geography, as he clearly has a real flair and passion for the subject. The day also includes a postgraduate voices session, a question and answer forum which allows current postgraduate students to listen to recently completed PhD candidates on all manner of their experiences. This year’s speaker was Cheryl McGeachan (University of Glasgow) who spoke about different opportunities and tools available to students to help boost their academic profile and learning experience, from teaching, to reading groups, to writing workshops. Cheryl’s enthusiasm is infectious, and it was great to have the opportunity to hear about different skills that could be gained throughout the research process through various, often creative, methods. The day as a whole provided an opportunity, over lunch, refreshments and in sessions, to engage with Historical Geographers, and Historical Geographies, and I would like to take this opportunity to thank all of the speakers for their interesting presentations, Carl Griffin (QUB) for providing some funding for the evening refreshments, and a special thanks to Lucy Veale for both chairing the sessions, and organising another fantastic Practising Historical Geography conference. The 17th annual Practising Historical Geography conference took place at the beginning of November 2011 in St. John’s College, Oxford and was attended by a record number of fifty-three delegates and speakers from eleven different institutions. The conference provides postgraduate students of Historical Geography with a taste of the breadth and vitality of work in the sub discipline as well as providing a welcoming environment for students to learn, experiment and expand their own theoretical and methodological skills to further their own research. As is customary, the day was bookended by two keynote presentations. This year’s speakers were Alan Lester (Sussex), whose paper was on the Humanitarian and Colonial Geographies of George Arthur, and Georgina Endfield (Nottingham) who spoke on Tropical Pathologies and Missionary Archives. Both speakers gave empirically rich, substantive and thought-provoking papers which together demonstrated the diversity of historical sources and approaches available to students. This was further evident in three short presentations given by recent undergraduate dissertation prize winners: Kallum Dhillon’s work on philanthropic social housing near King’s Cross/St. Pancras, Katariina Makela’s on Signe Brander’s photography in early-20th-century Helsinki, and Rory Hill’s work on Francophone Methodism in Jersey. All three of the presentations were remarkable in their clarity, empirical rigour and theoretical insight and showed great prospects for the future of Historical Geography as a whole. The conference also serves to provide a friendly environment for students to network and converse about their shared experiences of working and studying in Historical Geography. Although partly an informal process which takes place over lunch and refreshments, there is also a dedicated section of the program to opening up such discussions: the postgraduate voices session is a question and answer forum in which current postgraduate students have the chance to listen to recently-completed PhD candidates on all manner of their experiences, from the collecting and collating of empirical material and getting through the ‘writing up’ process, to publishing and career options. This year’s speakers were Caroline Cheeseman (Oxford) who spoke about her completed PhD thesis on the Changing Land, Law and Life on Cranborne Chase, 1786–1830, and the move from academia into museum and educational work, and John Law (Westminster), whose thesis explored the development of the arterial road network around London in the inter-war period, and his advice on getting published and securing a lectureship. The openness of the forum was, no doubt, of real value to those in attendance. In a practical sense, the conference helps to equip students with a set of methodological tools for working with historical sources. This was facilitated through two small-group workshops delivered by Innes Keighren (Royal Holloway) and Stephanie Wyse (RGS-IBG), who explored the use of autobiographical positioning in historical traditions of travel writing and the value of historical records at death, respectively. The concentration of small-scale methods workshops, postgraduate voices and keynote papers provided postgraduates in Historical Geography a unique experience to consider the entire process of historical geographical knowledge production, from the practice of working with historical sources and doing historical geography through to thinking about how these kinds of empirical materials can speak to wider theoretical interests. In short, the conference provided an opportunity for attendees to contemplate the process of becoming Historical Geographers. It is with this in mind, and on behalf of everyone in attendance, that we would like to extend our sincerest thanks to all the speakers, to Carl Griffin (QUB) for chairing some of the sessions and to Briony McDonagh (Nottingham), whose adept organisational skills and sheer dedication has, again, made the HGRG Practising Historical Geography conference a tremendous success. The 16th annual Practising Historical Geography conference was held in the School of Geography, University of Nottingham in early November last year. More than 50 delegates from 11 UK universities as far apart as Edinburgh and Exeter made the trip to Nottingham. After a brief welcome from members of the HGRG committee, the first keynote of the day was delivered by Prof. David Matless, who talked on the topic of ‘Accents of Landscape: The Horsey Mail, 1938’. The group watched ‘The Horsey Mail’, a documentary film shot by the GPO Film Unit during the Norfolk floods of spring 1938 which recorded the Post Office’s herculean efforts to deliver the mail to a small community cut off by the floodwaters. David used the film as a way of examining both the meaning of the term landscape and questions of authority and accent, pointing to potential tensions between local voices and attachments to landscape on the one hand and a survey view (represented by the film’s main narrator) on the other. In the postgraduate voices session, Dr. Lucy Veale (University of Nottingham) talked about her recent experiences as a PhD student, skilfully handling questions from the audience about how to successfully research and write a doctoral thesis. She also offered the audience a sneak preview of her new project on representations of climate change in East Midlands museums, showcasing some of the items—including weather diaries, recording instruments and natural history collections—she is currently working on. Before and after lunch, the delegates split into groups in order to attend two excellent workshops run by Dr. Susanne Seymour (University of Nottingham) and Dr. George Revill (Open University). Susanne talked about the archival, practical and ethical issues surrounding her work researching enslaved Africans and plantation landscapes, while George discussed some of the difficulties historical geographers encounter when practising theory in their work. Both the sessions were highly participatory, with delegates working in small groups to discuss how they might apply new ideas, approaches and sources to their own postgraduate research. The final keynote of the day was given by Dr. Caroline Bressey (University College London) who talked to the title of ‘Finding a new path through the archives’. Caroline introduced delegates to her work on the ‘Black Londoners, 1800–1900’ project, recounting how she had identified subjects in a range of sources including photographic albums kept by institutions like prisons, hospitals and children’s homes. She also talked through her plans for research funded by the Philip Leverhulme Prize, which she won in 2009. In doing so, Caroline highlighted some of the methodological problems she has faced as a historical geographer, interrogating the relationship between researcher and historical subjects as well as drawing attention to the difficulties posed by gaps in the archive. Many thanks to all the speakers and participants for making the 2010 Practising Historical Geographies workshop another informative and interesting day. The 15th annual Practising Historical Geography conference was well attended, with more than 35 postgraduates and staff from 14 different UK and American universities. After a brief welcome from new HGRG chair Nicola Thomas, the day was kicked off by Luciana Martins (Birkbeck, University of London). Speaking to the title of ‘Documentary film and photography in the making of historical geographies’, Luciana used a combination of still photographs and film clips to carefully interrogate the fascinating story of Alexander Hamilton Rice’s expedition to the Brazilian Amazon in 1924–5. In the postgraduate voices session, current PhD-student Lowri Jones (Royal Holloway, University of London) talked about her experience of archival research. Lowri held her audience captive with her account of some of the pitfalls and successes of her time researching the ‘hidden histories’ of exploration in the Royal Geographical Society archives. She also kindly answered questions on the practicalities and theoretical debates behind the ‘Hidden Histories of Exploration’exhibition she organised in collaboration with Felix Driver and the RGS, supported by the AHRC. Before and after lunch, the delegates split into groups in order to attend two excellent workshops on using archival sources. The first was run by Ruth Craggs (St. Mary’s University College, Twickenham) and considered the possibilities and problems of ‘Capturing atmosphere and juice gossip’. The second on ‘Sounding the archive’ was led by Alasdair Pinkerton (Royal Holloway, University of London) and investigated music, radio and noise as sources for historical research. Later, the group reconvened to listen to HGRG 2009 dissertation prize winner Robert MacKinnon (Aberystwyth University, now at University of Birmingham) discuss his undergraduate thesis, ‘The Great Western Railway’s rural England: ways of ‘being in’ and ‘moving through’ the English landscape in Great Western Railway publicity materials, 1918–1939’. Judged by this year’s adjudicators to be an incisive and innovative piece of work, Robert’s project investigated both the representational and performative dimensions of the construction of rural landscapes in inter-war England. The final paper of the day was from Keith Lilley (Queen’s University, Belfast), who offered a thought-provoking keynote on the title of ‘Mapping medieval geographies: putting the ‘historical’ back into historical geography’. Keith outlined the recent temporal narrowing of the sub-discipline, arguing that medieval topics have increasingly been abandoned in favour of more modern historical geographies. He made an impassioned call for geographers to take medieval geographies more seriously, an idea which prompted lively discussions both immediately after his paper and much later in the pub! Many thanks to all the speakers and participants for making it such an informative and interesting day, and to Heidi Scott for co-organising the event. The 14th annual ‘Practising Historical Geography’ conference was held in the Old Library of the Institute of Geography at the University of Edinburgh on the 5th of November. The event was well attended, with 43 participants drawn from around a dozen UK universities. Following a welcome from HGRG Chair, Hayden Lorimer, Professor Charles Withers (University of Edinburgh) began the day with the first keynote lecture entitled “Historical Geographies of Geographical Practice”. Outlining an ‘historical geography of geography’, he considered the history of the discipline and subject, looking at where geography has been variously housed, taught, learned, and its relationship to national identity. Geography’s strong links to empire and exploration emerged alongside a sense of geography as always negotiated, and made in a variety of locations, great and small. The experiment and laboratory were introduced as neglected fields of historiographical investigation (lagging some way behind fieldwork). The main body of the talk drew on the annual lectures of Section E of the British Association for the Advancement of Science, considering the formulation of civic science and the historical geography of speech and the reception of geography in the public sphere. Explorers drew in the largest crowds, the audience keen for sensational lecture material. Withers concluded with a provocation: that the impact of historical geography is such, that very nearly all geography now contains an historical consciousness. Ann-Therese Farmer (graduate of Oxford University and winner of the 2007 HGRG undergraduate dissertation prize) followed giving a short talk outlining the methods and main findings of her research project, “Work, wages and women: researching the capitalisation of employment in agriculture”. Her main sources for the study were farm account books for a farm in Surrey which gave almost daily entries for the period between 1760 and 1830. Through the analysis of around 12,000 entries, Ann-Therese had been able to track individual careers and wages over time, finding a dramatic decline in the role of women in agriculture with the transition to capitalism. The complexity of the results emphasised the importance of what Ann-Therese termed “grassroots research” at the local scale. Two workshops on working with archives followed, the first led by Dr Stephen Legg (University of Nottingham) considered our relationships with documents in the archive, a place in which we all work, and develop levels of familiarity and intimacy with things and with subjects. Steve provided a list of texts exploring the archival experience, and a summary of the variety of personal encounters it is possible to have with the archive. The role of the archive role in governing subjects, and the discovery of power relations in the archive were discussed. In small groups we shared our own archive experiences, and shared in Steve’s archive experience and encounter with Meliscent Shephard (representative of the Association for Moral and Social Hygiene in India between 1928 and 1947). In the second workshop Dr Carl Griffin (Queen’s University, Belfast) concentrated on the search for ‘resistance’ and revolutionary activity in the archive. In small groups we used a number of sources drawn from Carl’s own work, to examine the concept of resistance and the different forms it can take, acknowledging the potential for multiple readings. Merle Patchett (University of Glasgow) and Carolyn Anderson (University of Edinburgh) then hosted an extremely useful session on ‘Getting Graduate Research Work Published’, sharing their own experiences and picking up on general issues, worries and suggestions with the audience. The second keynote “Subaltern Space” was given by Dr Dan Clayton (University of St. Andrews). He drew our attention to the methods of knowing the subaltern, looking at differential space, the space of diversality, and paradoxical space, noting that the subaltern casts a shadow over geography. Whilst speculating how best to learn to listen to the subaltern, Dan offered seven paradoxes, concluding with that of impunity—a desire both for change and for a geography which does not try too hard to be up to date. Hayden Lorimer then closed the formal part of the event offering particular thanks to all speakers, Heidi Scott (University of Aberystwyth) the conference secretary and Merle Patchett for her efforts in obtaining funding for the event from the Arts and Humanities Research Council. After a wine reception, delegates enjoyed a tapas style Indian meal in Edinburgh. Many of us reconvened the following day for the “Spaces for and of Historical Geography” symposium—a day of six fascinating and insightful talks, each followed by lively discussion and questioning, illustrating the diverse nature of historical geographical research. The attendees of the 10th Annual HGRG Postgraduate and Undergraduate Practicing Historical Geography One-Day Conference on the 2nd of November were treated to a day of entertaining and challenging lectures and workshops. The University of Bristol was a fine host to the large group of more than 50 students, making the day’s workshops in particular an excellent opportunity for meeting people and sharing ideas. The day opened with Dr Avril Maddrell (of Oxford Brookes University) reminding us that we must not forget the ordinary stories in historical geography. Her examination of women geographers through archives, oral history and historiography demonstrated the ways in which we often overlook the people and contexts closest to us (in this case, for example, the histories of our own Departments) as worthy of research and recording. The two practical workshops of the day, on print cultures (led by Dr Robert Mayhew, of the University of Bristol) and photographic archives (led by Dr Elizabeth Gagen, of the University of Hull), emphasised the importance of questioning sources and interrogating their meaning beyond first impressions. Small group work had us asking questions about the agency of books and photographs as objects beyond their use to us as an historical source, especially the nature of authorship, ownership, audience and intended use. In the ‘Postgraduate Voices’ session in the afternoon, the HGRG Undergraduate Essay Prize Winner, Tom Wipperman, described his research on political activism in Clerkenwell. Brief presentations then followed by second and third year PhD students (Mary Kelly, Innes Keighren, and Stephanie Wyse) on their research approaches, sources, and the high and low points of undertaking historical geography. The day ended with a lecture by Simon Naylor (University of Bristol) on the challenges and rewards in recording how geography as a discipline has been experienced historically. He used a geography department’s all but forgotten glass teaching slides, the refurbishment of a lecture theatre, and the contested records of an Antarctic expedition as examples of both the preoccupations and the expertise of geographers historically. In doing so, he reminded us again of the day’s central themes – that practitioners of historical geography should not forget that the discipline itself and how it is practiced provide us with rich and often untapped sources (many beyond the traditional text and image) that reveal both the spaces and times in which geography is experienced by us all. Stephen Daniels’s keynote lecture, Exhibiting historical geography, served not only as an excellent introduction to the day’s proceedings, but also as a useful metaphor for the conference itself: an exhibition of current work in historical geography. Reflecting on exhibitions as both objects of study, and as tools of geographical research, Daniels (University of Nottingham) considered the ways in which these distinctive modes of display act to reframe historical geography by narrowing the distance between past and present, and by redrawing the boundaries between formal and informal knowledge. Drawing on his experience as an exhibition curator, Daniels considered his own position within what Tony Bennet (1995) has described as the “exhibitionary complex”. Describing his work on Art of the garden for Tate Britain, Daniels revealed how the practicalities of exhibition design conspired with more abstract issues of memory, enactment, and space to influence communication of ideas, the production of knowledge, and the making of meaning. Notions of enactment and of space were apparent too in the historical geography workshops which bookended the lunch break. In his discussion on Weimar-era Berlin, for example, Alex Vasudevan (University of Nottingham) explored the application of performative theory to the analysis of various textual and aural sources. In so doing, he pointed to novel ways of engaging with archival material, and revealed how performance and enactment might be recovered from otherwise inert historical sources. In their informative workshop on Planning the fashion city, David Gilbert and Bronwen Edwards (Royal Holloway, University of London) outlined a new cultural narrative for 1960s London. In describing the interaction of fashion and metropolitan cultures during this period, Gilbert and Edwards revealed how ideas of the city were differently conceived and constructed by consumers and by planners, and explained how narrowly Piccadilly Circus and Regent Street avoided the vicissitudes of 1960s urban regeneration. Caitlin DeSilvey (Open University) began her talk with reference to a famous image: M. C. Escher’s Puddle. For DeSilvey, the image served as a useful metaphor for her postgraduate experience: the puddle suggesting the clear, calm, intellectual reflection which she believed she ought to pursue, and the muddy, rutted track in which the puddle was located, representing the complex, negotiated, conflicted ‘real’ world with which she was less keen to become engaged. Detailing her time as a postgraduate, from studying the historical geography of Edinburgh’s allotments as a Master’s student, to her current Ph.D. studies concerned with a cultural analysis of material artefacts recovered from a Montana homestead, DeSilvey explained that her initial aspiration to avoid the ‘mud’, and to focus on the ‘reflection’, had gradually given way to a desire to integrate the two—to combine the more active and situated aspects of research with the more overtly contemplative, and in so doing to achieve a more holistic engagement with historical geography. In the day’s penultimate session, Sefton Lang (formerly of the University of Edinburgh) took his audience to the “highest office in the United Kingdom” for a discussion on his undergraduate study of the Ben Nevis Observatory. Lang’s work, for which he was awarded the 2003 HGRG Undergraduate Dissertation Prize, was concerned with the social history of a unique site of scientific inquiry. Lang explained how the panoptic perspective of the desolate mountain summit, combined with Victorian positivist confidence, rendered the Observatory a site of heroic endeavour and of scientific novelty. The themes of exhibition and of display were returned to by Nuala Johnson (Queen’s University Belfast) in her keynote lecture, which considered two distinct aspects of her research: public memory and botanical gardens. Focusing first on the role of the Great War in Irish popular memory, Johnson noted the various ways in which the War was understood by the contemporary populace, and the extent to which these understanding came to be rehearsed and reinforced through acts of commemoration and memorialization. Shifting focus to her work on botanical gardens in Belfast, Dublin, and Cambridge, Johnson explored the different ways in which nature was displayed, communicated, and understood. As sites of display, Johnson revealed botanical gardens to be contested spaces—at once venues of research and of display, of collection and of communication, and of scientific understanding and aesthetic contemplation. In her closing comments, Johnson reminded her audience that to practise historical geography is to practise theory—it is to engage in an inherently hermeneutic act, and, ultimately, to perform. On Wednesday 6th November, 2002, 30 delegates gathered for the 8th annual HGRG postgraduate and undergraduate conference. Delegates had travelled from all across the British Isles to Grey College, one of the more attractive of the colleges of the University of Durham, to participate in what turned out to be a valuable and enjoyable day. As usual, the conference took the format of two keynote papers by invited speakers in the morning, followed by workshops and postgraduate reflections in the afternoon. This year, we were very pleased to welcome Alison Blunt (Queen Mary, University of London) and Alan Lester (University of Sussex) as guest speakers, Hayden Lorimer (University of Aberdeen) and Alastair Bonnett (University of Newcastle) as workshop facilitators, as well as Sarah King (University of Durham) and Andrew Law (University of Newcastle) as out postgraduate speakers. As the day progressed, two broad themes emerged again and again. These were the relations between materiality and discourse, and our engagement with post-colonialism both as a set of ideas and as practice. Alison Blunt’s paper on Anglo-Indian women in India focussed on the multiple definitions of home as household, nation and diaspora, and the ways in which this ties in with memory and nostalgia. Alan Lester spoke about how geography as a discipline had tended to focus on the complicity of the discipline in colonialism rather than exploring the geographies of colonialism themselves, and began to chart some new ways of looking at the relationships between metropole and periphery. When we reconvened in the afternoon, the two workshop sessions ran concurrently with people moving between them. Alastair Bonnett invited people to explore precisely what we might mean by postcolonialism in his workshop on cross-cultural research, focusing on the identification of key cultural agents in research settings and ways of approaching and apprehending them. Meanwhile, Hayden Lorimer’s workshop examined the role of material artefacts in recovering the lost realm of historical embodied practices, inviting people to engage with, touch and smell books, notes and letters as artefacts. Following this, Andrew Law reflected on some of his concerns with the relationship between theory and historical research before Sarah King detailed her experiences of research. In all, the day was lively and engaging, with a good mixture of HGRG committee members and postgraduate students at different stages in the Ph.D. process. The day illustrated some currently important debates in historical geography and gave delegates a sense of a wider community of historical geographers and of shared concerns. I would like to thank all those present on the day to extend all our thanks again to the staff of Grey for their organisational assistance and skill.